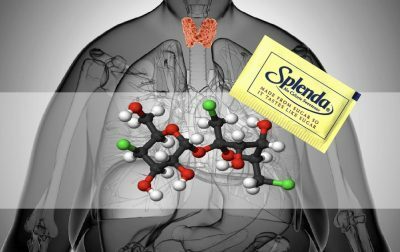 Is sucralose (aka Splenda) really as safe a sugar alternative as its manufacturers and advertisers claim, or is it really a toxic chemical causing a wide range of health problems including thyroid suppression and weight gain? New research sheds light on this question. 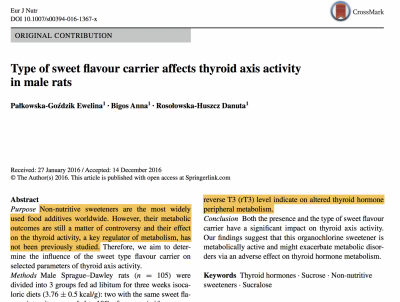 A concerning new study published in the European Journal of Nutrition entitled, “Type of sweet flavour carrier affects thyroid axis activity in male rats,” is the first study of its kind to evaluate the effects of Splenda (Sucralose) on mammalian thyroid function and metabolism. Their findings reveal that sucralose has endocrine disruptive properties on the hypothalamic-pituitary-thyroid axis (HPA axis), resulting in thyroid hormone suppression, increased appetite, and weight gain. Before we delve into the details of the new paper, it is important for our readers to understand that this study is not novel in finding harm. There is, in fact, an accumulating body of research on sucralose showing this chemical marketed as an artificial sweetener is causing a wide range of adverse health effects. For instance, our sucralose research portal reveals 15 different signals of harm linked to this artificial sweetener, such as neurotoxicity. When you add to this well-established body of research the recent discovery that sucralose produces carcinogenic dioxins when heated, the bitter truth about this artificial sweetener, namely, that it is a chemical in the same class as highly toxic pesticides like DDT, comes to light. This is all the more disturbing when you consider that Splenda is regularly advertised to consumers as a safe sugar alternative specifically for baking applications. For instance, have you seen the TV ads where parents are encouraged to use it presumably to keep their kids healthier than if they used natural sweeteners? If not, you can visit the Splenda Baking and Cooking page which features a picture of a woman holding her son while baking. Also consider that a recent government-funded study found sucralose contaminated 65% of all breast milk samples assayed. In other words, the use of this toxicant is so prevalent that even our most vulnerable populations are incapable of opting out of being exposed to it. In order to accomplish this, they studied 105 Sprague-Dawley rats, divided into 3 groups, who were fed at their will (ad libitum) for 3 weeks one of the three different diets. The diets had identical caloric content (isocaloric), comprised of starch (wheat starch)differing in the following ways: Diet #1 contained no sugar. Diet #2 contained 10% sucrose (10 grams). Diet #3 contained enough Sucralose (.0167 grams) to create the same sweet flavor intensity as Diet #2 (10% sucrose). In other words, sucralose significantly altered the thyroid and metabolic functions of the animals in a manner that could overlap with the symptoms of hypothyroidism. So why are studies like this not regularly performed on humans to remove nagging doubt about their relevance? One reason is the prohibitive cost. Another, perhaps more significant hurdle, is that it is unethical to test chemical safety on human subjects. This obviously makes for great regulatory challenges in unequivocally proving human safety. So, how are the majority of chemicals released onto the market tested for safety? Animals. And so, the argument that animal studies are not sufficient to demonstrate plausible toxicity in humans is absurd, given that the toxicological risk assessments used to justify releasing chemicas like sucralose into the human food supply are invariably based on animal studies. Sucralose: A Sweetener or Pesticide? Another highly concerning observation was that sucralose’s effects are similar to those observed with other organochlorine chemicals in its class, which include dangerous pesticides. The stiudy also noted that previous researchers have doubted the safety of sucralose based on observations that sucralose intake alters expression of both “rat intestinal P-glycoprotein (P-gp) and cytochrome P-450 isozymes, which are key components of the detoxification system in first-pass drug metabolism .” In other words, sucralose induced responses in the body consistent with the perception that it was doing physical harm, and needed to be removed from the body in the way other toxicants are handled. The researchers conjecture that sucralose’s adverse effects on the thyroid axis would be reflected in “thyroid hisopathology,” i.e. thyroid lesions/tumors. Could this be one of the causes behind the mysterious global uptick in thyroid cancer diagnoses? This study leaves far more questions than answers. First, why are regulators turning a blind eye to the accumulating body of research indicating that sucralose is a highly toxic chemical whose safety has not be established? Second, why would anyone risk exposing themselves to a chemical when the evidence indicates that artificial sweeteners of all kinds promote weight gain, and increase appetitde — the last two things those who wish to lose weight, or “cut down on sugar” want? Our team is blazing a path to natural health and wellness. Each of us is a firm believer that our bodies can heal themselves naturally of any ailment if given the proper tools. But we're not just believers, we've experienced the healing properties of natural remedies first hand. That is why we are so deeply passionate to report natural health news, share wellness tips, and provide proven natural products to you.